This call for proposals is launched in the framework of the Council of Europe Project “ROMACT IV – Building up political will and understanding of Roma inclusion at local and regional level” (ROMACT IV). It aims to co-fund working visits as part of the ROMACT Transnational Cooperation and Capacity Building Component, which aims at assisting local authorities in better integrating marginalised people, in particular non-nationals of Roma ethnicity. Send these documents in electronic form (Word .and/or PDF) to the following e-mail address: romact@coe.int. 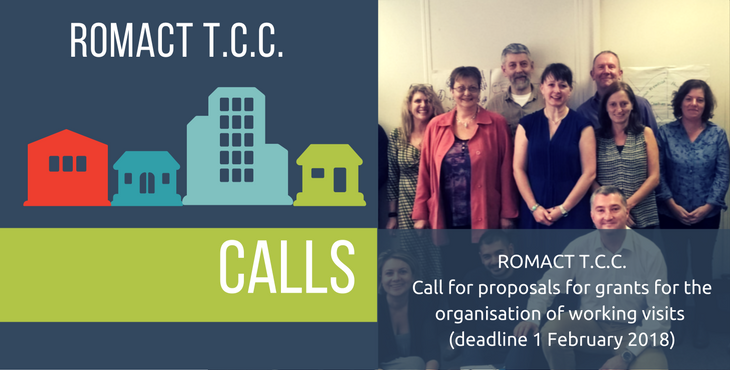 Emails should contain the following reference in subject: ROMACT Grants - Call for proposals – TCC Working visits. Non-profit entity is eligible only if it works on behalf of or is mandated by the relevant municipality. “A signed letter of intent from the local public authority delegating authority to non-profit entity for these purposes” means that a letter from the local public authority (municipality) delegating its authority to an organization that applies for the grant for organization of working visits within ROMACT TCC component and in case of successful grant award that would organize and take part in the working visits on behalf of the municipality. Q: What does “Bank /financial statements authorised by a financial officer of the applicant” mean? A: Bank statement is used to prove that an applicant is not “in a situation of bankruptcy, liquidation, termination of activity, insolvency or arrangement with creditors or any like situation arising from a procedure of the same kind, or are subject to a procedure of the same kind”. Bank statement is a printed record of the balance in a bank account and the amounts that have been paid into it and withdrawn from it, issued periodically to the holder of the account. Q: What does "Contact details of referees;" mean? A: Referee is a person to whom inquiries can be made in order to verify the relevant statements in the application. Q: How specific a programme must be, given that at the time of applying it is not possible to finalise all details of the visit? A: Draft programme without timing, which includes planned meetings is sufficient. If the application is accepted, then final agenda can be sent once it is finalised. Q: How specific the provisional budget must be? A: An estimated budget should be as specific as possible in accordance with the template in Appendix II. Please note that the total amount of the budget proposal, its clarity and completeness is one of the award criteria of this call. Please carefully read what are eligible costs to be covered by a grant. Q: Are there any example of the estimated budget available? A: Unfortunately we cannot provide you with any example of the budget. The template to be used for the budget proposal is provided in the Appendix II of the call.